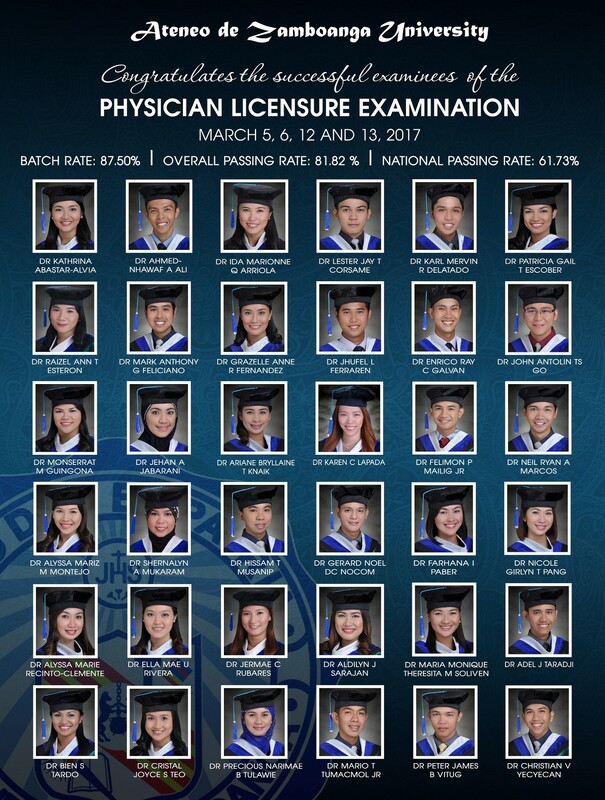 The Ateneo de Zamboanga University School of Medicine (AdZU-SOM) once again came up with an impressive performance during the recent Physician Licensure Examination (PLE) given last March 5, 6, 12 and 13 in Baguio, Cebu, Davao, Manila and Zamboanga. The university garnered a 87.50% passing rate (35 out of 40 examinees) for first-time takers and an overall performance of 81.82% (36 out of 44 examinees). This is significantly higher compared to the national passing rate of 61.73%. The new doctors are Kathrina S Abastar, Ahmed-Nhawaf A Ali, Ida Marionne Q Arriola, Lester Jay T Corsame, Karl Mervin R Delatado, Patricia Gail T Escober, Raizel Ann T Esteron, Mark Anthony G Feliciano, Grazelle Anne R Fernandez, Jhufel L Ferraren, Enrico Ray C Galvan, John Antolin Tan S Go, Monserrat M Guigona, Jehan A Jabarani, Ariane Bryllaine T Knaik, Karen C Lapada, Felimon P Mailig Jr, Neil Ryan A Marcos, Alyssa Mariz M Montejo, Shernalyn A Mukaram, Hissam T Musanip, Gerard Noel DC Nocom, Farhana I Paber, Nicole Girlyn T Pang, Alyssa Marie A Recinto-Clemente, Ella Mae U Rivera, Jermae C Rubares, Aldilyn J Sarajan, Maria Monique Theresita M Soliven, Adel J Taradji, Bien S Tardo, Cristal Joyce S Teo, Precious Narimae B Tulawie, Mario T Tumacmol Jr, Peter James B Vitug and Christian V Yecyecan. AdZU-SOM was founded in 1994 with the mission to help provide solutions to health problems of southwestern Mindanao, and to serve the needs of the regionâs poorest and most isolated communities. It is the pioneer medical school in the country to introduce Problem-Based Learning (PBL), an innovative, adult teaching modality. It is also a world leader in Community-Oriented and Community-Based Medical Education and Competency-Based Evaluation. To date, it has produced 358 board-certified graduates with 97% of its graduates opting to remain in the country, with 70% practicing in the region, 38% of whom are in remote, rural and conflict areas. In past years, its graduates have landed in the top 10 in the PLE. The AdZU-SOM is a member of the Training for Health Equity Network (THENet), a global movement of schools committed to transforming health professional education to improve health equity. Like THENet member-schools in underserved and rural regions of Africa, Asia, Europe, the Americas and Australia, AdZU-SOM pioneers innovative approaches to increase access and quality of care in the rural and remote communities of southwestern Mindanao.